Today, business leaders are seeking innovative ways to solve IT problems faster, significantly reduce costs, and manage risk more effectively across the enterprise. As technology converges, disruption emerges. When systems and process categories collapse, innovation inspires the imagination. Video, meetings, and messaging are integrating, and the benefit is simplicity. The silo solution is inefficient and rapidly becoming redundant. This trend is driving increased adoption of intuitive solutions, which is enabling more efficient enterprise collaboration across the world. Integrated solutions transform the workforce, ignite commercial change, and shatter conventional thinking. Today, business leaders are seeking innovative ways to solve IT problems faster, significantly reduce costs, and manage risk more effectively across the enterprise. It’s time to think about how new ways of working, both at home or remote locations, are prompting change within businesses and optimising the workforce. With integrated voice, video conferencing, messaging and collaboration capabilities, employees in enterprises can expand their connections and meet in real real-time, share content instantly, and reliably communicate with their customers, partners, and employees anywhere in the world and from any device. Today, the effectiveness of a communications ecosystem is in its engineering simplicity. There is no need to over engineer a device or a solution when an uncomplicated, yet secure, architecture will achieve the goal of reliability, sustainability, and longevity. The convergence of video, meetings, and messaging means technological intelligence is moving away from the device and migrating to the cloud. The virtual world is more visionary and smart - the hardware is more hands-on and functional. Therefore, standardising on solutions that offer interoperability with multi-platform devices allows participants to connect smoothly in real-time and in high definition. The cloud has disrupted the physical on-premises model and offered enterprises the freedom to do more with less. Technical capabilities are converging in the cloud and moving away from traditional physical infrastructure. According to Gartner’s “Forecast: Unified Communications, Worldwide, 2Q18 Update," those segments with revenue of $6.8 billion in 2017 will grow to $7.1 billion by 2022. The core growth driver in this mix is cloud conferencing, with a compound annual growth rate (CAGR) of 5 per cent through 2022. Another key trend related to this market is that the proportion of organisations using embedded audio conferencing delivered through their meeting solutions provider will rise from 10 per cent of meeting solutions users in 2016 to 65 per cent in 2022 (according to Gartner’s “Forecast: Audioconferencing, Worldwide, 2016-2022”). Cloud-based converged conferencing services (audio, video, meetings, messaging, etc.) continue to take market share from standalone applications. This trend reflects the fact that integrated solutions avoid a disjointed approach to meeting room experiences and provide a much easier, seamless way to scale your collaboration plans in line with the growth of your business. There are a number of important factors that enterprises need to consider when looking at how they can improve the way they meet and collaborate. Interoperability should be at the forefront of every enterprise decision-maker’s mind when selecting a video conferencing solution. 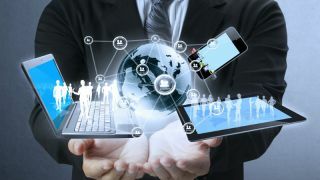 The ability to connect seamlessly with colleagues from anywhere and any device is a blessing for enterprise customers who want to focus on meeting and not IT complications. Enterprises decision-makers need to ensure that they select video conferencing systems that deliver flexibility and do not tie them into restrictive meeting room solutions or a vendor lock-in situation. Cloud-based solutions are intelligently engineered to allow enterprise users to reliably and securely connect, communicate, and collaborate more efficiently. By transforming the enterprise meeting room experience, users can seamlessly meet and share in an instant. Security should be a core focus for any enterprise when selecting a video conferencing and collaboration platform. A survey conducted by Vanson Bourne, on behalf of StarLeaf, included 500 enterprise decision-makers across the UK, US, France and Germany, and found that 96 per cent of respondents felt that security was important when selecting a video conferencing system. Hackers will go to great lengths to disrupt an enterprise. In November 2018, Tenable, the Cyber Exposure company, announced that its research team had discovered a serious vulnerability in a desktop conferencing application from a US based video communications company that allowed a remote attacker or rogue meeting attendee to hijack screen controls, impersonate meeting attendees via chat messages, and kick attendees out of meetings. Encrypting the video transmission and data, strengthening the authorisation process, and implementing an advanced firewall are some of the techniques that providers adopt to create a safer environment for the operation and users. With a fully managed cloud architecture, businesses can experience frictionless system updates, managed data hosting, content sharing, video streaming and recording, as well as safe instant messaging services. Remote and office-based workers can also intuitively use intelligent solutions with the confidence that their conferencing is secure. The ‘always-on economy’ has dramatically transformed work patterns with staff increasingly adhering to the sentiment of ‘work is something I do and not where I go’. More people are working from home or remotely to be efficient with their time and resources, working around family schedules, and other lifestyle commitments. The increasing globalisation of enterprises also means that teams are often distributed around the world but still need to collaborate efficiently to get the work done. With reliable, cloud-based video conferencing, enterprises have the opportunity to empower their employees to collaborate more effectively. Traditional ways of working, such as relying on emails to communicate or voice calls alone, are no longer sufficient to support workers who are increasingly reliant on being able to instantly connect and communicate with colleagues across different countries. The latest collaborative solutions have never been so pivotal to enabling enterprises to interact with intuitive ease and provide workers with a secure environment in which to work. Enterprises are taking advantage of integrated technologies to accelerate business and collaborate seamlessly. Technology convergence presents enormous opportunities to expand and enhance customer interaction and enable the workforce to work more efficiently at the touch of a button. Innovation is changing the way we work and is a driving force behind new service capabilities and market dynamics. Speed to market is essential for success and keeping ahead of the competition. Most workloads in the years to come will be processed in the cloud. At this rate, enterprises that are slow to adopt a robust cloud strategy and make the transformation to digital business initiatives risk being left behind.